Hello again everyone! I have now completed my second month here as an intern at Kuda Huraa and life has certainly been busy. (If you missed chapter 1, read it here). It’s been a month of ‘turtle releases’, with a number of our head-start turtles being released on multiple guest snorkels. On 13 January, we released Daisy and Petunia after they had reached a straight carapace length of 30cm. Our turtles are released only when they reach this length as it gives them the best chance of survival in the wild. The turtles were released after just 11 months at Kuda Huraa and were from the same nest that was laid on 20 December 2014 at Fenfushi, Raa Atoll. In addition, two more head-start turtles – Emily and Henry – were released on one of our turtle snorkels on 27 January. Emily and Henry were from a nest that hatched on 15 February 2015 at Fenfushi. Guests joined us on both occasions in saying goodbye and good luck to the four Green Sea Turtles as they began their journeys in the Indian Ocean. The coral propagation programme has kept me extremely active this month. I have continued with monitoring of the Channel site coral frames, and all 316 frames have now been completely monitored. The site is also being mapped and I have been replacing lost number tags so we can more correctly identify the frames; helping with future monitoring and allowing guests to be able to view their sponsored frames should they return to Four Seasons at Kuda Huraa! Another mission for me was to assist in re-arranging some 85 of our existing coral frames into a new site named “the Starfish”. The move called for a large team effort and after some considerable hulk-style muscle power from us all, the Starfish is now complete. 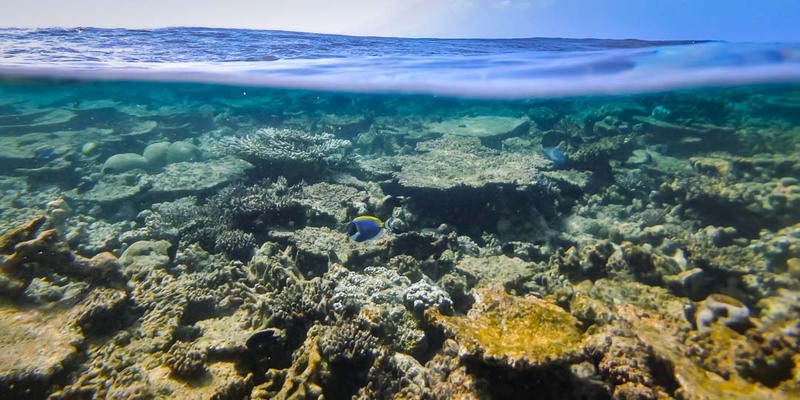 The site is located near our House Reef and “Turtle” frame sites, making it a perfect location for the frames to develop and grow into a new reef site. 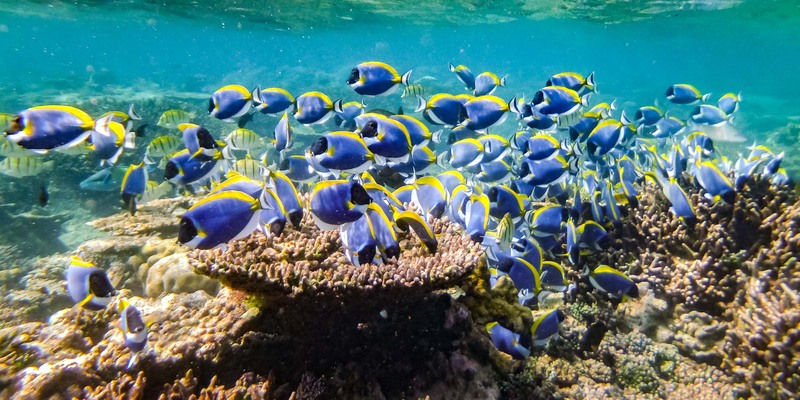 The ideal conditions for coral growth and frame development at these sites include the presence of ‘rubble’ substrate, strong water currents and suitable water depths of 1-2m. The Starfish site has also been re-transplanted with 186 coral fragments from house reef donor colonies, and I am currently monitoring the frames here too. Monitoring of the Water Bungalows site has also been started, and I have currently monitored 62% of the frames at this site … putting me on target for imminent completion! In addition, my fragment growth research project has showed some positive developments. The surviving Acropora digitifera fragments are displaying some slight growth already. I can only hope that the majority of fragments continue to do well, so that I have some solid data on which to base my conclusions concerning optimal fragment sizes for coral propagation. Some of the fragments have even started to lay down tissue over the cable ties and on the frame, indicating they are adapting well to the prevailing conditions and beginning to cement to the frame. 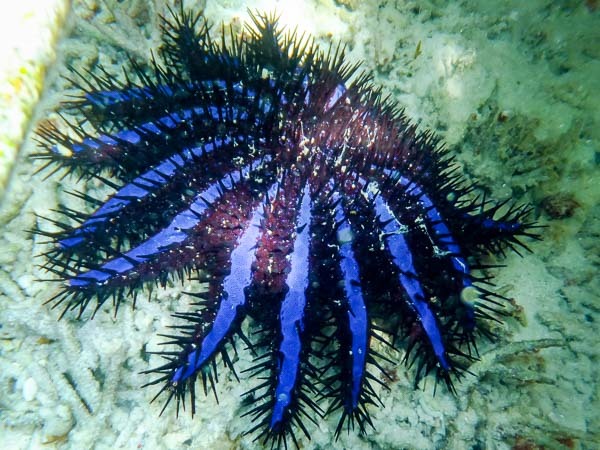 Unfortunately, this month has also seen a boost in numbers of Crown-of-Thorns starfish (COTS, Acanthaster planci) around Kuda Huraa. 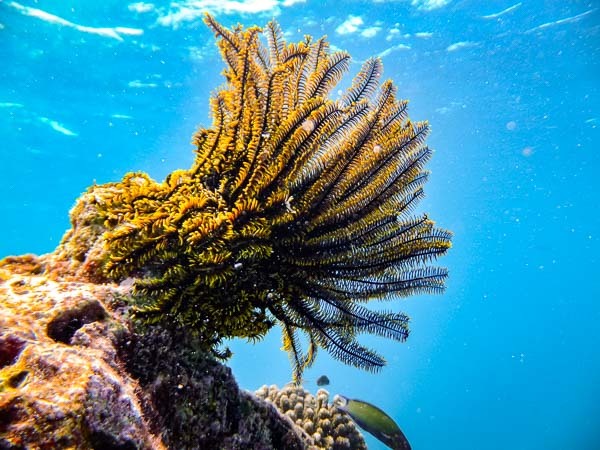 COTS can grow larger than 80cm in diameter and can have more than 30 arms. They feed on coral polyps by spreading across living corals, everting their stomach onto the coral surface and digesting the coral tissue. Bands of white or pale scars will often be observed on areas of our reefs where they have been feeding. 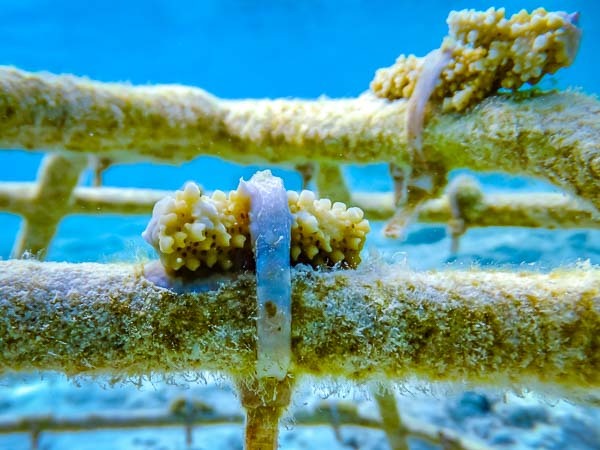 In low numbers, COTS can be useful in removing our older coral communities, creating space for new recruits, though if ‘outbreak’ numbers are reached (15 COTS/hectare) whole areas of reef can be destroyed within days. This month alone, over 100 COTS have been removed from reefs around Kuda Huraa. 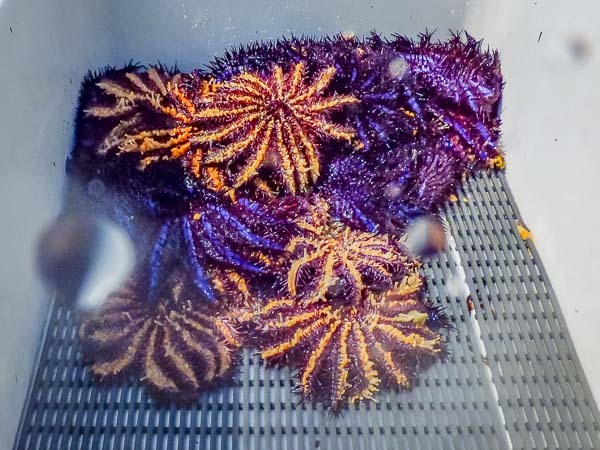 This effort will hopefully ensure that COTS numbers are controlled and therefore the majority of our corals will remain largely untouched by this predator. This month I have also been giving marine biology presentations and leading some of the adventure snorkels. 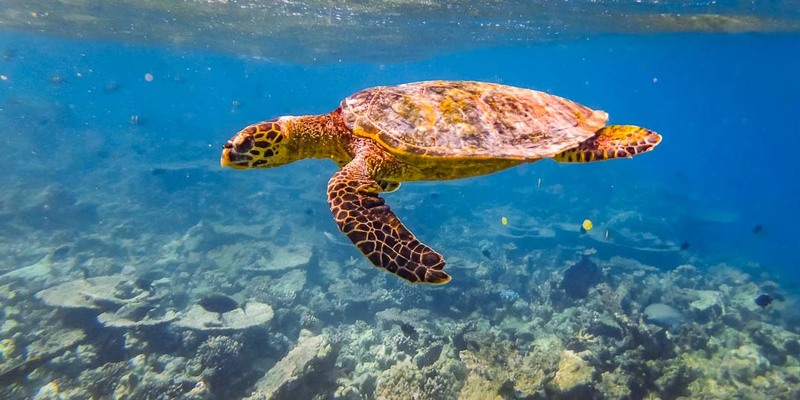 This included a turtle snorkel to Tingiri reef with some repeat-visit guests, where we saw four Hawksbill turtles, many colourful feather stars, two large schools of hungry surgeonfish and a small electric blue lobster – a glorious bounty for any avid snorkeler! The current was extremely strong but I found leading the snorkel to be very rewarding and the guests left happy. I have had more opportunity to work on my ‘guest-relations’ this month in leading the build-a-reef and insight to corals activities and also making coral frames with guests. The activities generally involve me giving a brief overview of corals, making a frame with the guests and placing it by the jetty before it is moved to a suitable site around Kuda Huraa. Once again these activities have been extremely rewarding and it is always nice to speak with people who share an interest in corals and wish to learn more about marine conservation and coral propagation. My second month here has also given me the opportunity to learn skills which will be beneficial to my future career. Sam (coral biologist) has been teaching me about QGIS mapping software and imageJ analysis software, which I am using to measure the fragment growth rates in my project. 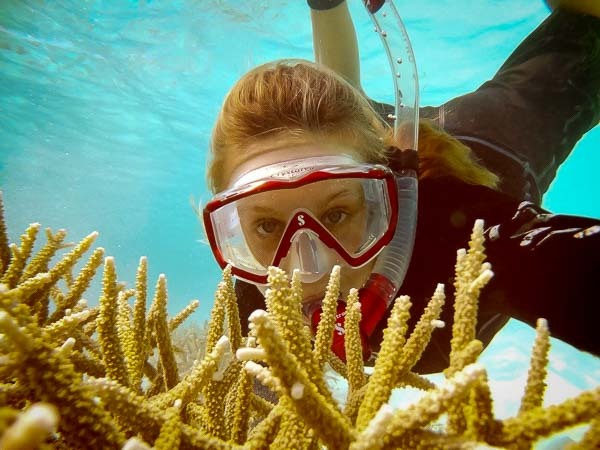 Developing skills such as these is helping me gain more technical experience and become familiar with common scientific approaches to researching corals – something I have always had the desire to do.